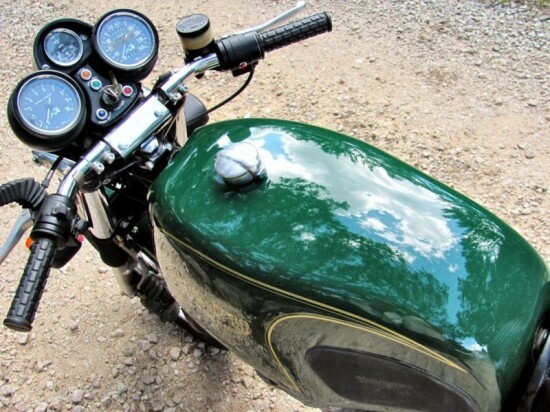 With the slow winding down of the British Motorcycle industry there are a couple examples of people taking the bits and pieces that were left over and making something better. There is the case of Paul Dunstall purchasing the remains of the Norton’s racing department. And as the seller explains, this 1975 Triumph Trident was developed by Les Williams with what was left to work with when Triumph closed their doors. 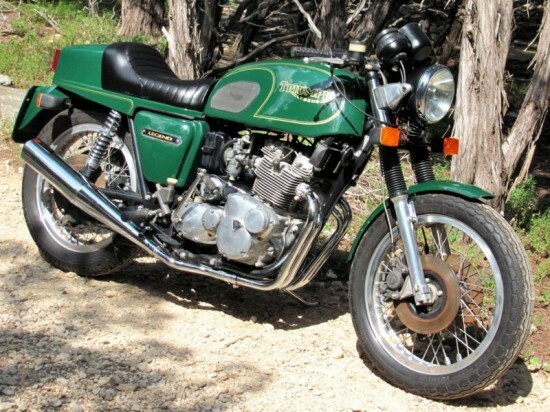 The Triumph Legend was a limited production motorcycle hand built by Les Williams, the former Triumph factory road racing manager best known for producing Slippery Sam, the production racing T150 750 Trident which won five consecutive Isle of Man Production TT races from 1971 – 1975. Slippery Sam and Les might have won more TT races if the rules had not been changed to exclude motorcycles more than 5 years old (and had also won 5 times?). 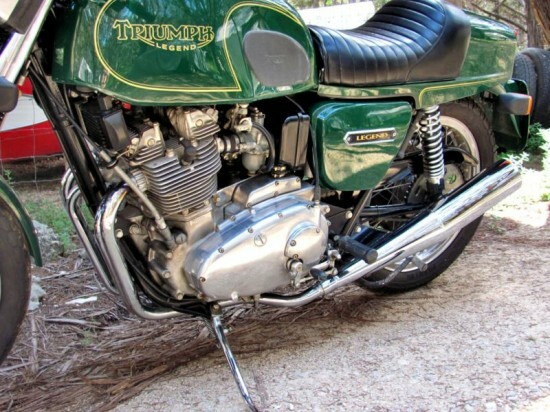 The Legend models were produced after the demise of Triumph at Meriden, and represented what Les felt a production Trident might have evolved into if Triumph had survived. After showing the initial prototype Les Williams received hundreds of orders, however production was limited by their hand-built nature. 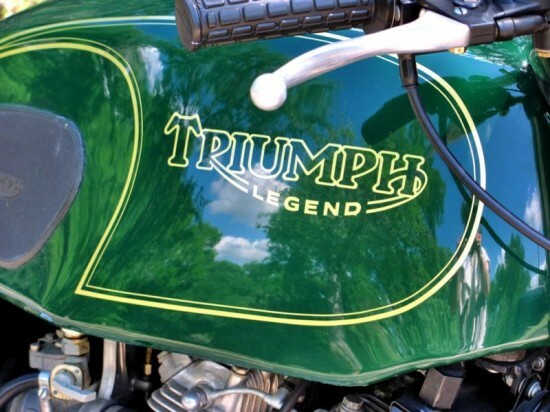 Between 1975 and 1992 a total of 60 (some say 61, others 70) Triumph Legends were built before Les retired. Each Legend is individually numbered, this is Number 23 and it also bears a optional source plate for the original purchaser. I’ve heard that Legends were employed for a while by the marshals at the Isle of Man TT but cannot find a solid reference. 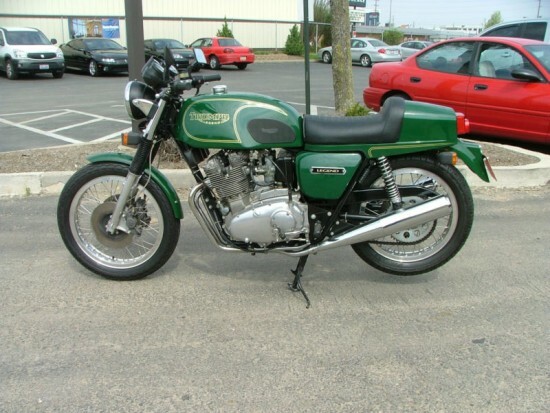 The Triumph Trident was the company’s attempt to fight back against the rise of the Japanese Motorcycle Industry. 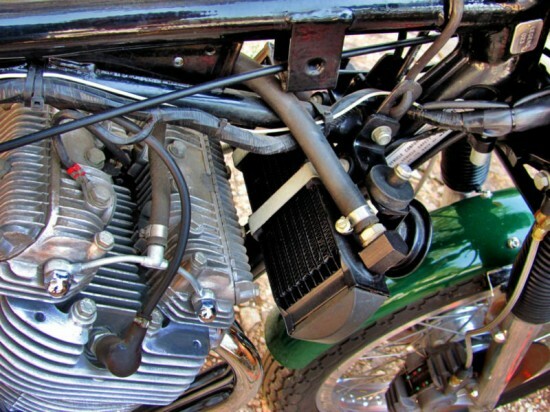 Bert Hopwell and Doug Hele had started developing a triple that would add a third cylinder to the original parallel twin developed before WW II. The two had started down this road in 1962, and had a running example by 1965. But because of the internal friction between BSA and Triumph, who had become one company, the triple wasn’t shown until 1968, and by that time, Honda had the CB750 on sale. I have ridden the Legend only about 100 km in the last 10 years, mostly to show it at concourse events where it always scores well. Compared to regular T160, the Legend feels narrower and lighter with a much more refined road feel from the smooth controls, improved suspension, effective brakes and superior riding position. Performance is on par with other Tridents I’ve owned but more power lurks within this engine once it is properly run in, and Les provided exact written procedures for that process. It is worth noting that the first 219 km were put on the machine while still in LP William’s possession, to more properly sort the engine setup. The first and second owners also put very few miles on the machine, treating it more like a museum piece than a motorcycle and storing it well. There is a receipt in the folder from when the machine first changed hands in 1994 for the sum of $22,500. The Trident used for the bases of this Les Williams special is the T160 with its 750cc triple which generated 58bhp at 7500rpm from the factory. Being that Les Williams had done so much with his race efforts with Slippery Sam as mentioned by the seller, I would imagine that there is a little bit more then what the factory offered. The one thing apparent is the twin disk up front and single in the rear. But because the seller put so few miles on it, their input is limited. From 1975 until 1992 only 60 are reported to have been assembled.